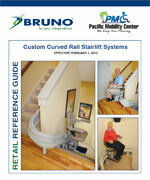 Bruno’s Elite Curved Rail model offers a safe and durable design that installs on virtually all curved stairways! Leading-edge technology assuring complete stability as you move up and down the stairway – even during power outages, and inside turns offer the flexibility of mounting the curved stairlift on either side of the staircase. Curved staircases are an elegant and prominent part of your home, don’t allow them to compromise your independence. A curved stairlift by Bruno is the solution! 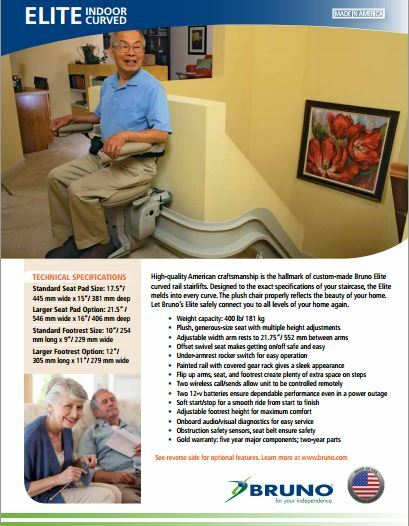 The Electra-Ride III Custom Curved Rail Stairlift can be installed in just a few weeks! With a curved stairlift, you not only retain the beauty of your home, but extend your freedom throughout it. These magnificent stairlifts are created by American craftsmen to the most exacting specifications. An attractive stair chair of this quality and style will add to the elegance and functionality of the home you love.